Tea bags were invented in the early 1900s to make brewing quicker and clean-up easier. More than 100 years later, not too much has changed. We are a world of tea-drinkers (but coffee has it’s own problems). Unfortunately, our normal dunk-brew-toss routine of the tea bag is not sustainable. It actually contributes an insane amount of waste to the landfills. Unless specifically stated otherwise, all tea bags are generally comprised of 20% plastic (polypropylene) rendering them unsuitable for compost. 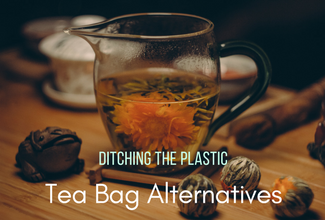 Instead, we’re here to explore more environmentally-friendly alternatives to tea bags. For a sense of magnitude of this specific plastic problem, consider that in a single day, the British are estimated to drink 165 million cups of tea, of which 96% is brewed via a tea bag 1 https://www.tea.co.uk/tea-faqs . That equates to more than 158 million tea bags per day – just envision that for a moment! We are not even talking about the entire world, we are just talking about the UK – a population of 65 million 2 https://goo.gl/7c3LQC . The tea bag seems innocent enough: a paper-like packaging holding tea leaves; tough enough to withstand hot water for 5 minutes; dangling by a string for your dipping convenience. Unfortunately, while the tea bag is indeed mostly paper-fiber, it is also around 20-30% polypropylene (PP, i.e. plastic). This means most of the 158 million tea bags from the UK (and considerably more if we account for the whole world) are going to the landfills every day! Tea bag manufacturers recommend that you rip open the tea bag and compost it, bag, leaves, and all. The tea and 75% of the tea bag will compost as normal, but of course the 25% polypropylene plastic will not. They advise that if the non-compostable materials are still visible after compost, you can just pick them out at the end. This is not the answer, but is indeed an imperfect solution if you must continue using a tea bag. Unless I’m parched and need to simply chug a few glasses of water, I generally prefer my water seeped in something to add a bit of flavor. Indeed, at an average of 2-3 cups per day, I can be considered an avid tea 3 Technically, a drink is only considered tea if it comes from the Camellia sinensis plant (i.e. only green, black, white, and oolong are truly teas). Every other seeped / brewed drink (including herbal varieties like peppermint and chamomile) are merely herbal drinks. However, for simplicity purposes, when I refer to tea in this article, I am referring to anything that is seeped in water (i.e. the more popular use of the word tea). enthusiast. The act of brewing my tea and taking a moment to pause during my day is something that I cherish. This is the ideal alternative to the tea bag. You can drink the same tea, but without the plastic. These days, it is quite easy to find a loose-leaf tea shop, especially if you’re in a larger city or town. Tea shops will have a wall lined with large containers of tea from which to choose. The benefit of visiting a tea store is that the shop will often let you smell the tea to get a better idea of the flavor before buying. From personal experiences, this has indeed swayed my purchasing decisions. I know some people avoid loose-leaf teas because they think it will add a lot more work in making a cup of tea, but I’m here to refute this notion. With loose-leaf teas, all you need is a large infuser similar to this that can fit over any mug. I find that these are much easier to use, clean, and maintain over time. After use, simply flip over and toss the leaves, then rinse under the sink. No taking apart different sides needed, no unnecessary silicone animals chilling in your tea cup, no extra plastic / silicone parts – just simply a stainless steel tea filter that does it’s job. Easy, and I think you’ll find that loose-leaf teas have a far superior flavor. Instead of getting the crumbs, the loose tea dust, and the broken tea leaves that are in tea bags, you’ll be purchasing the high quality, whole leaf teas, generally for comparable prices (but without the “convenience” of the plastic tea bag). When I lived in Los Angeles, I found a stall at the farmers market that sold fresh green plants. Basil, rosemary (i.e. the usuals), but also unique ones. My favorite turned out to be the chocolate mint plant. Take some of its leaves, seep into hot water, and you have a delicious, minty, herbal drink that smells divinely of chocolate. The best part is that you have a perpetual supply (as long as you take care of your plant!). You can try many other varieties including the strawberry mint plant, thyme lemon plant, and lavender, amongst others. See if there is an herb plant supplier at your local farmers market. Otherwise, you can also order online. While this option assumes you at least have an elementary-level green thumb (to take care of herb plants), it’s a great alternative to tea bags if you can manage it because you can just seep your leaves right in your mug. A natural way to sweeten your water is to drop a few pieces of freshly cut fruit into your glass. Fruit water is yummy both warm and cold. Delicious ideas include a mix of strawberries, watermelon, oranges, lemon, limes, cucumber, or berries. You can find “recipes” online, or you can create your own combination based on your taste preferences. Don’t worry, it’s quite difficult to mess up fruit water. If you’re feeling a little fancy, you can use sparkling water. Sparkling strawberry water is one of my favorites. Extra: You can also simmer roots and spices (i.e. ginger, horseradish root, cinnamon stick) to create delicious hot drinks. My favorite drinks from each of these 4 categories are loose-leaf Oolong, herbal tea brewed with fresh chocolate-mint leaves, sparkling water with strawberries, and warm water with cucumber (adding cucumber actually gets me to drink a lot more water, for those looking for a hydration idea). What are your favorites?